NEW MEXICO is one of those states where it’s easy to assume you know what you’re in for: red rocks and scrub brush, old highways stretching across vast desert…and then you arrive. Snowy peaks and evergreen forests paint a brand new picture of this state; raging river gorges, ancient volcanic calderas, and brilliant white sand dunes prove it’s as diverse as it is wild. These aren’t just gorgeous landscapes, these are views unlike anywhere else. 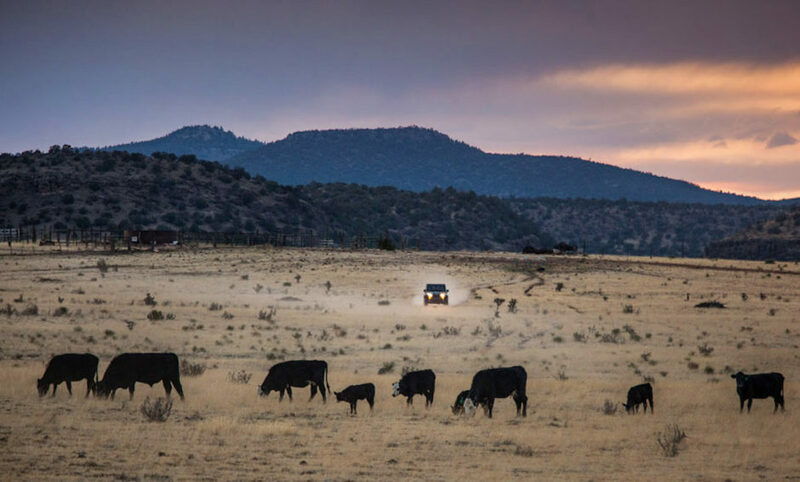 A drive 50 miles north of Santa Fe puts you in the village of Abiquiu, and there you’ll find Ghost Ranch, a 21,000-acre retreat and education center surrounded by views like this on all sides. You can hike, backpack, and watch the wildlife here year-round, but the best way to get deep into this territory is to experience it from the water. The Rio Chama, a tributary of the Rio Grande, has cut a canyon through northern New Mexico whose sandstone walls reach 1,500 feet in places. 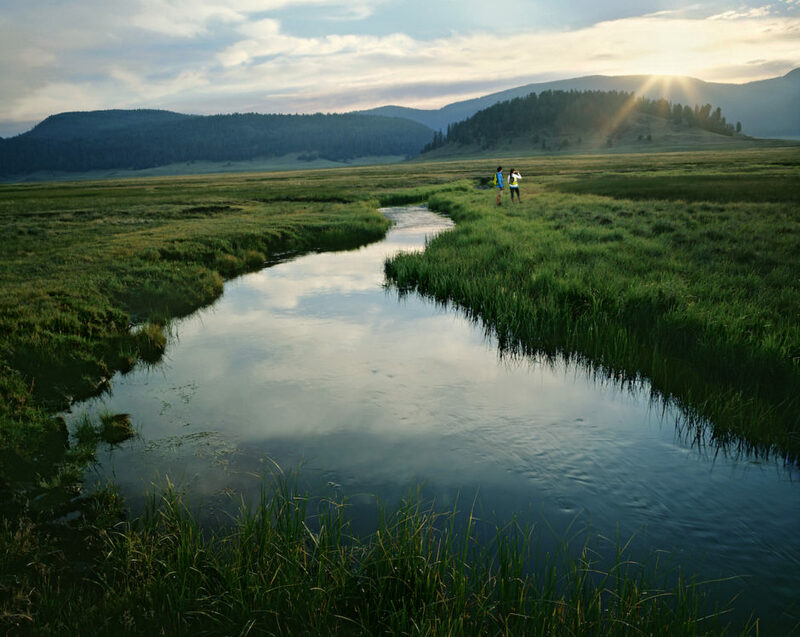 You can put in south of El Vado Reservoir and float the Chama to Abiquiu Reservoir (pictured above). It’s $5 per person for the 31-mile run (with class II-III rapids), and there’s a lottery to assign launch dates — keep your schedule flexible to incorporate this epic New Mexican odyssey. 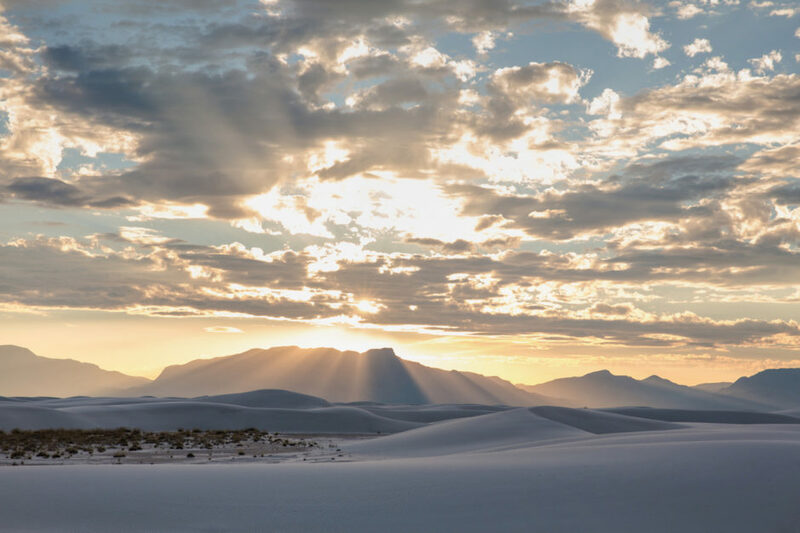 Northeast of Santa Fe lies nearly 1.6 million acres of terrain that would stun those unfamiliar with New Mexican landscapes. Up here the climate is mild in summer and the snow can pack up to 10 feet in winter — far from those desert images most of us in other parts of the country typically picture. Wheeler Peak, part of the Sangre de Cristo range, tops out at over 13,000 feet and is the highest point in New Mexico. There are serious hiking opportunities here (over 1,000 miles of trails, but who’s counting? ), but the area is also great for hunting and fishing (three rivers flow through the forest, along with many streams and lakes), and camping this land puts you in mule deer, elk, turkey, black bear, mountain lion, and bighorn sheep territory — so keep your camera at the ready. 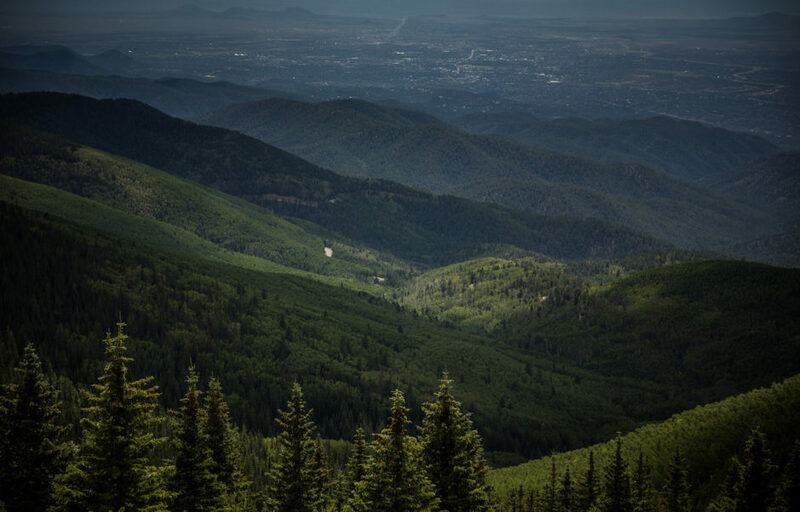 There’s also the Santa Fe National Forest Scenic Byway, 15 miles of road tucked between aspens and evergreens that takes you to Ski Santa Fe. Over a million years ago, the New Mexico landscape wasn’t nearly as gentle and gorgeous — it was covered in lava. Though clearly today the caldera is full of soft grass valleys, forest, and trout streams, there are elements of the past still lingering in the form of hot springs, fumaroles, and natural gas seeps. Trails crisscross the preserve, and a few are designated exclusively for horseback riding. In winter, this is an incredible place to cross-country ski. But there’s far more to the Sandias, and they’re actually New Mexico’s most-visited mountain range (which is saying something — the state has plenty). If you’re looking for a steep hike, stick to the west side; the east side is much gentler. 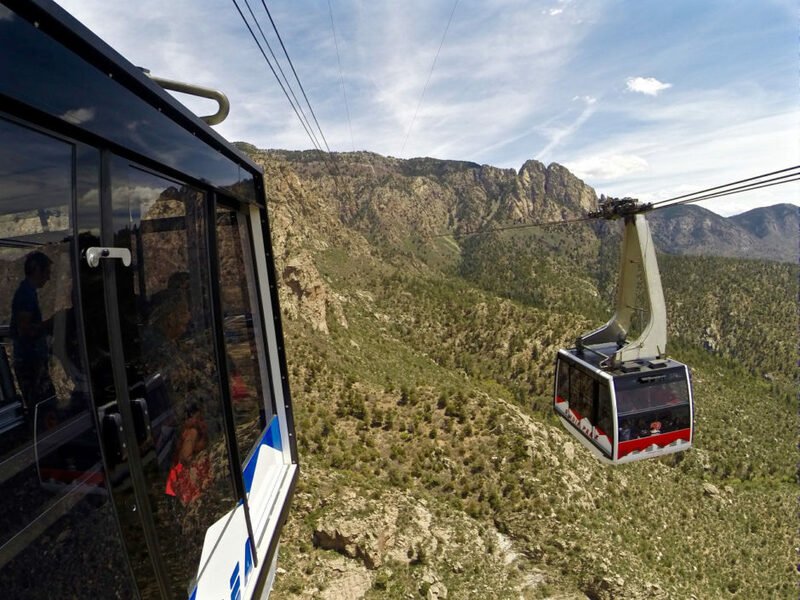 There’s also the Sandia Peak Tramway, which stretches from the outskirts of Albuquerque to the top of Sandia Peak — a distance that makes it the longest aerial tram in the US. To keep to the ground, take the Sandia Crest Byway, a road of twists and turns that winds all the way up to the summit (not quite 11,000 feet). The majority of the national forest requires four-wheel drive to access. To get by otherwise, stick to the White Mountain Wilderness (the other half, Capitan Mountains Wilderness, is a bit more rugged, but also worth it). There you’ll find dozens of trails — most at high elevation — that offer wicked views of the land that spreads out beneath the mountains. 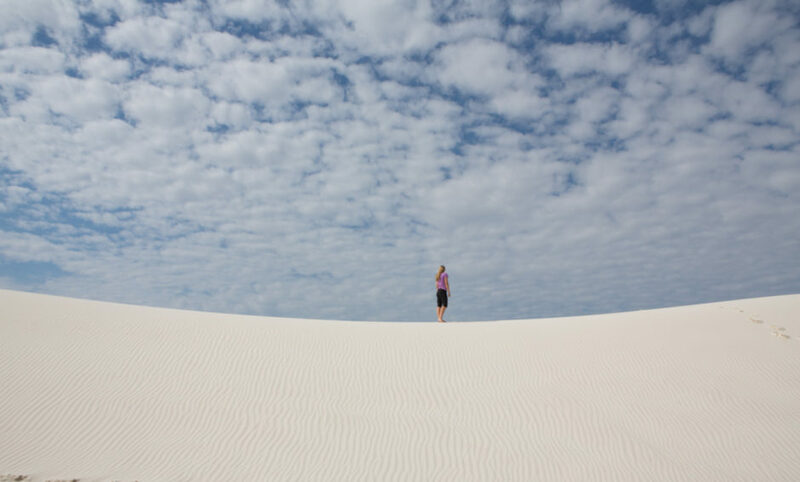 Technically it’s the largest gypsum dune field in the world, but we’ll just call it the most jaw-dropping pile of sand on this side of the planet. The 16-mile loop of the Dunes Drive is a good place to start in the otherwise daunting list of things to do when it comes to this national monument. The drive takes 45 minutes and threads into the heart of the basin, giving you plenty of chances to get out, walk up the dunes, and take photos. Afterward, embark on adventure via one of the five hiking trails, go backcountry camping, or bring a sled to sail down the white stuff at 20mph. Entrance to the monument is $5 a person, but there are lots of fee-free days in 2016 to celebrate the National Park Service’s 100th anniversary. The majority of this national monument northwest of Santa Fe is undeveloped wilderness, but Bandelier’s claim to fame is its preserved pueblo structures dating back to 1150 AD (evidence of human habitation here extends much further, perhaps as far as 11,000 years). The Main Loop Trail (1.2 miles) is a good option for exploration, as it passes through four different archaeological areas. At the west end of the loop, you can link up with the Alcove House Trail, a .5-mile hike that takes you to the Alcove House, a pueblo large enough to house 25 people (and it once did). The site is reached by wooden ladders and stone stairs, so this is not your typical boots-on-dirt hike. If you’ve extra time, go for the Falls Trail. At 2.5 miles long, it winds past two waterfalls and ends at the Rio Grande. A 50-mile-long, 1,300-foot-wide gorge cuts into the New Mexico landscape northwest of Taos, falling a steep 800 feet to the waters of the Rio Grande that have carved it over the millennia. 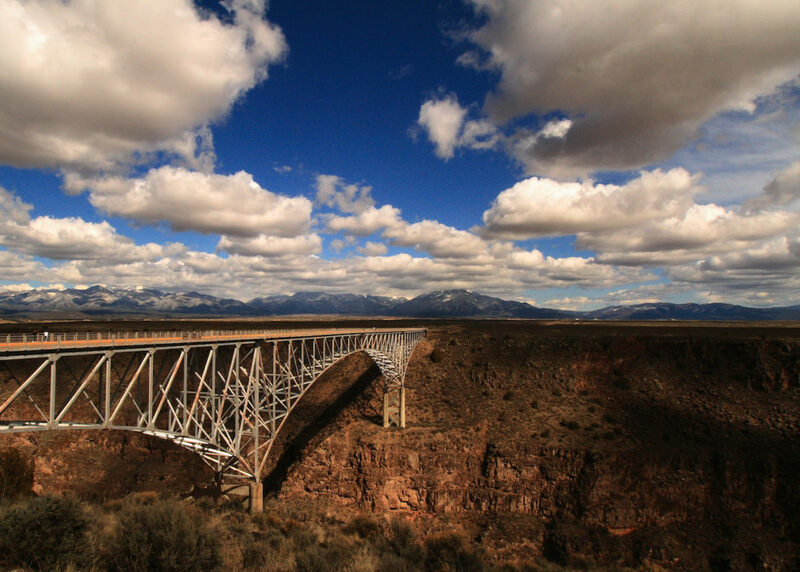 The Rio Grande Gorge Bridge, right on US-64, is a site to see in itself (it’s the fifth-highest bridge in the US). There are sidewalks on both sides to get that epic aerial shot. The views from the top of the gorge are incredible, but there’s more to experience at the bottom. Dozens of ancient petroglyphs adorn the canyon walls, hot springs bubble up here and there, and the river flows through class II-V rapids for anyone willing to take them on. 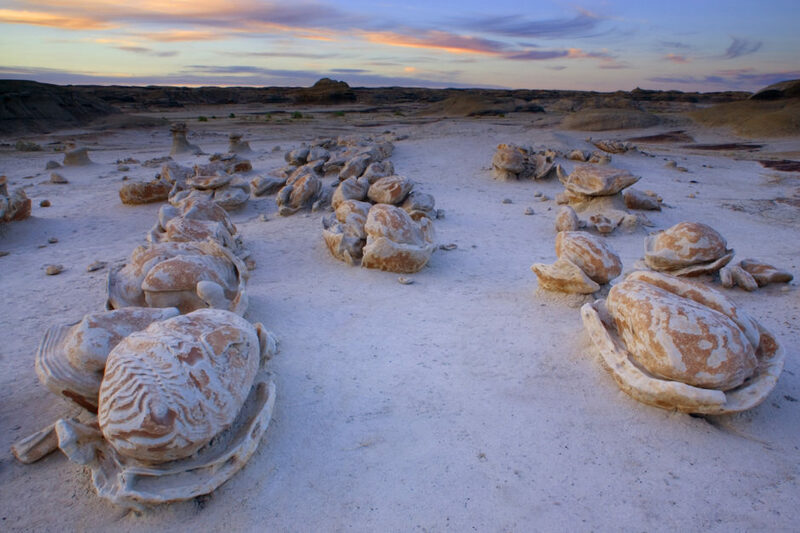 The Bisti/De na Zin Wilderness Area is still so unknown, even nearby towns don’t have signs pointing visitors in the right direction. Your best bet to get to this fantasy world of petrified wood and alien rock formations is to take NM-371 from Farmington and head due south for 42 miles. Once you’re there, finding your way doesn’t get much easier — there are no marked trails, so you’re best off taking a compass or GPS (along with plenty of water). It’s one of the few areas left in the US suitable for those seeking a true wilderness challenge, and a complete escape into Mother Nature.